Going without electricity for a few days can throw off the whole balance of a family. When living in an apartment or condo there are simple ways to keep the family in clean clothes, power electronics and provide decent cooking options. You just have to know a few things about preparedness for power outages. Most apartments or condos don’t come with an emergency power generator. Not only are most generators are expensive to buy (portable or not) but they also require fuel. Between the two, that’s a good deal of resources and space used up in your home. Luckily there are other ways around a generator. This, along with a car battery, could be your emergency power supply. I have seen so many things that can be run on a car battery. I have even been able to find an adapter that has electric sockets so items can be plugged in. 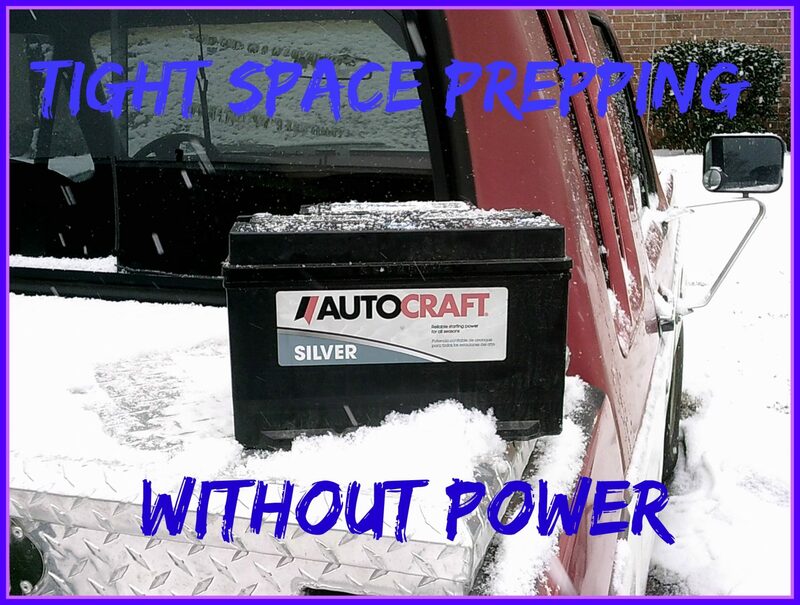 If you have access to your car battery you can run anything from a shower to a stove. With the above mentioned adapter you could even run an electric fan if you needed to. When you choose to use a car battery as a power source, you have the ability to use the item you are powering without needing to keep a generator running. This is particularly helpful if you have built your own generator. Best of all, a car battery can be charged and used again. Solar power can be useful for charging those little things we have trouble living without in our lives. Depending on the size of the solar charger you can power anything from a phone to a laptop. Some solar chargers are also made to be mobile. They come in the form of a pad you can roll up and take with you or are small enough to store in a purse. If you rely on electronic devices to stay in touch with people, organize your schedule, pay bills, or for your livelihood, this is an important part of preparedness for power outages. YoutTube has a large number of creative ways to produce power using treadmills, exercise bikes and mountain bikes. Rather than chemical energy (in the form of fuel) you are using kinetic energy (in the form of body movement) to power a device or to charge a car battery (a car battery is fully charged around 12.6 volts). Building these generators may require other components such as energy adapters, alternators and serpentine belts depending on which type of generator you choose to build. It’s important to use a video, book, or website that shows very detailed instructions with regard to building your generator. Being without power or stuck in our homes for a while doesn’t suddenly make us happy to wear dirty clothes. There are some options available to help us get our clothes clean. ready to be rinsed in clean water in the second bucket, wrung out, and hung on a clothesline. If you don’t have laundry facilities (or don’t want to shell out five dollars per load) these sweet little machines also reduce the amount of laundry that you will need to take to the laundry mat when there isn’t an emergency. If you have a larger family they are great for keeping up with socks and under garments. Smaller families can just keep up with clothes daily. Over loading a hand cranked washer may not break it, but your clothes won’t agitate well and will remain dirty. In a long-term power outage, you’ll want to completely re-think the way you and your family dress. There’s a reason why, for many decades, women wore aprons and pinafores. They protected the clothing underneath, which stayed clean-ish for weeks, if necessary. Made of lightweight cotton, aprons were much easier to wash and quicker to dry than heavier pieces of clothing. Believe it or not, the type of drying rack you choose matters a great deal. You want to make sure to choose one that has a good solid base or can hang from the ceiling. Also, make sure that you can space your clothes far enough apart to maintain air flow. Without air flow to help your clothing dry they may just mildew on the rack. When your condo or apartment has a balcony, you can get away with a lot when it comes to laundry. You don’t really need a spin dryer because your clothes can drip dry from racks placed on the balcony. This is particularly true in hot, dry areas. When you don’t have a balcony or you live in a colder or more humid climate, having a spin dryer is the best way to go with an electric free laundry program. Small spin dryers can be powered by a car battery, although it’s possible to make your own hand-powered version. If you don’t have access to a spin dryer have a hanging drying rack over the tub in your bathroom. This will enable your clothes to drip dry without you needing to put down a tarp. Just make sure that the bathroom has plenty of airflow. Open windows and doors or set up portable fans. There are couple of other items that can be easily stored and be useful in a extended power outage. These items make living conditions more comfortable for your household. There are battery powered portable showers on the market, and there are some that run off of a car battery. Just plug it into the cigarette lighter. This is ideal for a camping trip, but can get complicated when you’re indoors. For indoor showering there is a portable shower that pumps water out of a bucket. The one I found can be recharged from a laptop USB, filters water and has a water filtration system. There are many option for cooking without electricity. A simple one is the BBQ grill, and some apartment complexes provide them in the common areas. The very basic models fit well on a balcony. If you don’t have a balcony there is even a mini BBQ grill that is easier to store indoors. It’s perfect for grilling on a porch. Watch for sales on charcoal around the major outdoor/picnic holidays, such as Memorial Day, Independence Day, and Labor Day. One year I was able to stock up on 8 gigantic bags at a huge discount at Lowe’s. There are a few varieties of camp stove that are also an option, such as the dual-fuel EcoZoom stove. Kerosene stoves are a tried and true option, and there is also a stove that will run off a car battery. If your cooking or heating source uses an open flame, whether with wood, kerosene, or some other fuel, it’s absolutely vital to never leave that fire alone, have at least 2 fire extinguishers in the house (and everyone knows where they are and how to use them, have plenty of ventilation, and a carbon monoxide detector/alarm. Solar cookers are a long-time favorite of those wanting an alternative way to cook food and heat up water for emergencies. They are also a far safer option than anything that requires a flame. You can make your own, but the Sun Oven is considered to be one of the best. Whatever you use to cook your food it will need a power source. Determine which fuel or power source works best for your family and with your available storage space and then stock up on that fuel, and lots of it. Great post!!! I never thought of using my car battery instead of a generator. And, thank you for addressing the needs and concerns of an apartment dwelling prepper….I appreciate it. My family lived off the grid for over 8 years so I know just how handy power inverters can be. The important thing to keep in mind that if you plan on using a car battery, you need to start your car from time to time to keep it charged. People often make the mistake of using regular car batteries with their inverters and they quickly ruin the battery. Regular 12v automotive batteries don’t do very well if you let their charge get too low. A 12v deep cycle battery is a much better alternative to a regular car battery because they are specially designed to be deeply discharged without damaging them. I would never recommend using a standard car battery unless it was a last resort. 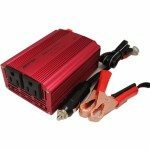 Deep Cycle Batteries are a must use for power inverters.